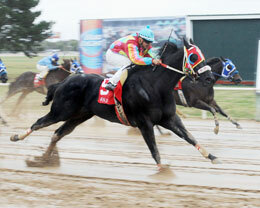 I V Gone, under jockey Mario Delgado, splashes home a winner in Saturday's OQHRA Fall Classic at Will Rogers Downs. CLAREMORE, OK�OCTOBER 11, 2014�Ridden by jockey Mario Delgado, I V Gone got the first call and never looked back as he raced to a 1� length victory over Painted Laico Bird in the $19,300 OQHRA Fall Classic at Will Rogers Downs Saturday afternoon, Paint Candy Flying was three-quarters back in the show position. The Tana Caldwell trainee covered the 400 yards, over a sloppy racetrack, in a quick :19.424 seconds to earn a 105 speed index. It was the sixth career win for the IVORY JAMES 4-year-old owned by Danny Salisbury and Robbin Caldwell. The $11,292 winner's purse boosted I V Gone's career total to $81,865. L.P. Frank bred the black gelding in Oklahoma from the Takin On The Cash mare Bye Bye Bygones. Painted Laico Bird races for owners Jimmy Jones and Charles Hainline. Bred by Jones, the Pyc Paint Your Wagon 3-year-old is trained by Luz Chavira and ridden by Ivan Carnero. Out of the Call Me Together mare Laico Bird Chic, the stakes winner earned $4,004 to push her earnings to $98,902. Paint Candy Flying, also by Pyc Paint Your Wagon, picked up $2,265 for his third place effort. Alfredo Gomez saddled the gray gelding, out of Fly Candy Fly by Strawflyin Buds, for owner Elite Oilfield Services. Carl Pevehouse is the breeder. Runaway E T, Black Rosalita, Painted Josy and Power Possum completed the field. IVORY JAMES and Pyc Paint Your Wagon are full brothers.